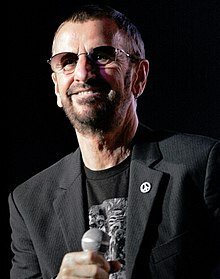 Sir Richard Starkey, MBE (born 7 July 1940), known professionally as Ringo Starr, is an English musician and actor. He is most famous as a member of the Beatles. He joined the group in 1962 as a replacement for their first drummer Pete Best. He quickly became well-liked and very popular. He sang lead on some of the band's songs including "Yellow Submarine", "Act Naturally", "Don't Pass Me By", and "Octopus's Garden". Starr acted in several movies aside from the ones he did with the Beatles, including The Magic Christian (1969), That'll Be The Day (1973), Caveman (1980), and the role of Mr. Conductor on the children's show Shining Time Station, during its first season (1989). (Comedian George Carlin later took over the role). He also narrated the children's show Thomas the Tank Engine and Friends for the first two seasons (1984). He also made a movie with the Beatles called A Hard Day's Night in 1964. He guest starred in the first episode of Courage the Cowardly Dog as an Alien Duck. ↑ Barratt, Nick (23 November 2006). "Family detective: Ringo Starr". Telegraph. Retrieved 16 June 2010. This page was last changed on 15 November 2018, at 06:48.